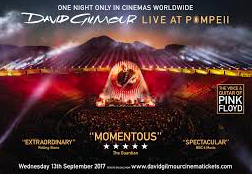 ‘Live in Pompeii’ DVD, CD and LP collection. Once again, I’m truly blessed to be singing background vocals on this spectacular album, alongside Bryan Chambers and Lucita Jules. What an honour to perform at such an eventful venue so steeped in history. To sing with David is a one of the highlights of my career, but to be joined by Greg Phillinganes on Keyboards & Vocals, Chuck Leavell on Keyboards & Vocals, Steve DiStanislao on Drums, Chester Kamen on Guitar & Vocals, Guy Pratt on Bass, Double Bass & Vocals, Joao Mello on Sax & Guitar was an unbelievably amazing band. A pure joy to sing all the songs of David and Pink Floyd’s legacy.